A cubicle showcased some of the monkeys used for scientific research at Harvard’s New England Regional Primate Research Center in Southborough. At a secluded research center 25 miles west of Boston, Harvard Medical School scientists have used primates to make key discoveries over the last half-century, earning the center a unique spot in the region’s landscape of prestigious biomedical research institutions. They unambiguously showed that nicotine is addictive and did experiments that laid the basis for the ongoing quest to develop an HIV vaccine. At the end of May, the long history of the New England Primate Research Center will come to an abrupt end as Harvard takes the unusual step — one that is baffling to many researchers — to close the Southborough facility. 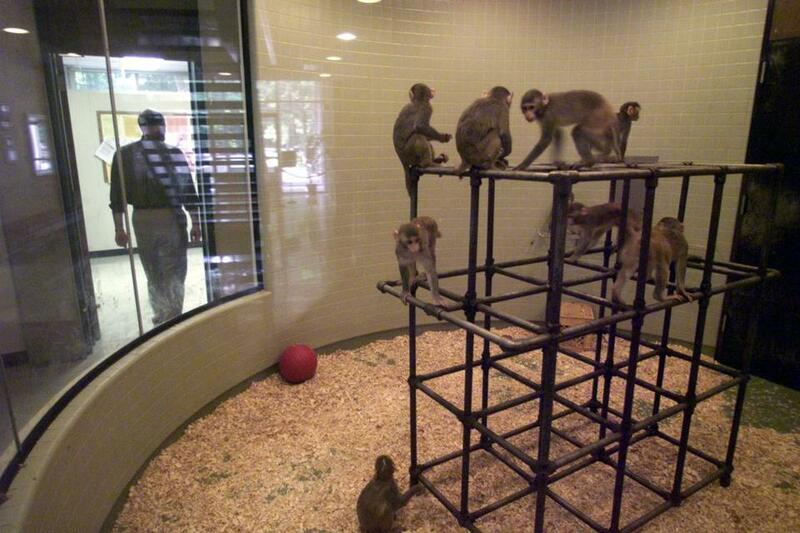 It is one of eight national primate research centers, and in the past half-century, the only one to shut down. Closure is necessary, Harvard says, for “strategic” reasons — not because of a series of high-profile revelations of monkey deaths at the center. But closure, at a cost to Harvard of $10.8 million so far, has meant the relocation of some 2,000 monkeys, mainly to other centers, layoffs of staff members, loss of faculty, and the end of roughly $25 million a year in research funding. It leaves Harvard in the unusual position of taking a major step back from primate research at a time when the science remains a powerful tool to examine both new and old biomedical threats. The research center, set to close, is being investigated after some of its monkeys died upon arriving at the Oregon Zoo. By all rights, the center’s epitaph should be its long list of scientific contributions. But mounting evidence threatens to overshadow that legacy, evidence of problems that were deeper and more troubling than Harvard has admitted, with broken lines of communication between the remote center and the leading medical school that owns and operates it. Those issues were revealed dramatically by the deaths, between 2010 and 2012, of four monkeys, animal care failures that resulted in a $24,000 fine by federal regulators. Then the Globe reported last month that a dozen monkeys were found dehydrated and dead in their cages or were euthanized for poor health between 1999 and 2011. The deaths reignited complaints from animal rights activists about the center’s treatment of monkeys. Documents obtained by the Globe show a startling level of disregard for protocols that govern animal research. An internal Harvard investigation of a monkey’s death in 2010, which first attracted public scrutiny to the center, reveals that the incident was only reported after a federal inspector showed up unannounced, 20 days after the death. A scientific journal is looking into a study done at the center because a former directorhas questioned its integrity, saying that he believes that many of the monkeys included in the research were treated in an inhumane way. Harvard Medical School dean Dr. Jeffrey Flier said the decision to close the center was unrelated to these problems and the loss will not diminish the university’s research capabilities. A report prepared by a Harvard committee investigating the initial monkey death in 2010 shows just how high the stakes were in running such a facility. These weren’t minor issues at an out-of-sight suburban campus; the committee saw the problems they uncovered as a direct threat to Harvard’s standing. “The public at large rightfully expects research with animals to be carried out in the most ethical manner and with the utmost scrutiny as to the animal’s welfare,” the report said. “Without such scrutiny,’’ the report continued, “we put the institution at risk’’ both reputationally and financially. 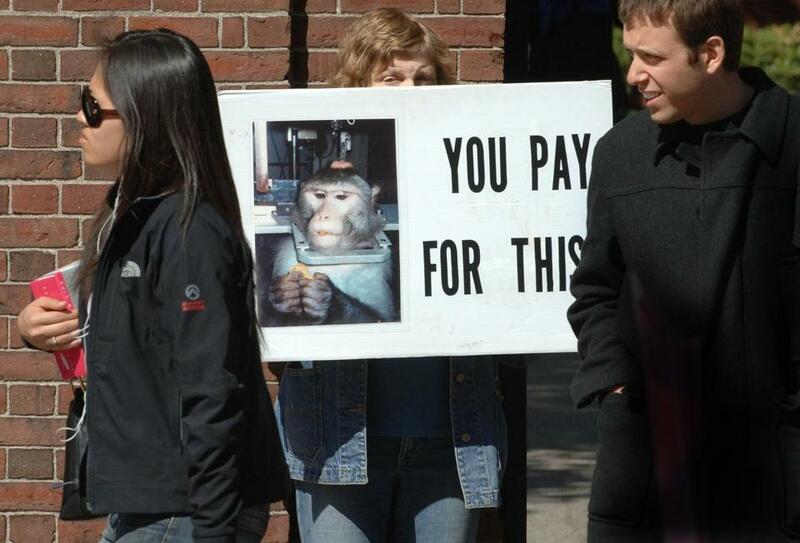 Members of the Massachusetts Animal Rights Coalition protested Harvard’s use of monkeys in research. In the 1960s, the US government established the regional primate centers, where scientists could study and conduct experiments on animals that are closely related to human beings. The eight centers scattered across the country are an enormous national investment. Harvard has received $268 million in taxpayer-funded base grants since 1980 to maintain its primates, $8 million since 1989 has been given for construction, and many millions more have supported individual research projects. Compared with laboratory mice or cells in a dish, primates can provide deep insight into complex behaviors, infectious diseases, or neuropsychological ailments that afflict people. But it is precisely because the animals so closely resemble humans that the research comes with huge responsibilities. The public trust in the taxpayer-funded enterprise, which is largely closed off to the public due in part to concerns about violence from animal activists, depends on institutions following the Animal Welfare Act and other policies. There are unannounced inspections, but oversight depends largely on the requirement that adverse events be promptly reported so that underlying problems can be quickly corrected. At the Southborough primate center, that oversight appears to have been largely delegated to the leadership team in place at the remote, wooded campus. The center is so distant that Flier, the medical school dean, whose name is listed on $90 million worth of taxpayer-funded grants for the center since 2007, said he has been there only three or four times and never visited until after problems began to emerge. “For many years, the New England Primate Research Center’s leadership team had a track record of advancing science, while Harvard Medical School administrators worked with the center’s on-site management team,” Flier said in a statement. Flier said that when problems were identified, medical school leadership decisively intervened to make large-scale changes to leadership and procedures. However, evidence gathered by the Globe suggests that the problems did not happen overnight. Oversight appears to have broken down in fundamental ways and seeped into the culture of the center well before the medical school leadership discovered them. The event that sparked attention to the center occurred on a Wednesday morning in June 2010. According to a report of the Harvard internal investigation obtained by the Globe, two animal technicians waited for a high-temperature wash of a primate cage to finish. When it was done, they made a horrifying discovery: the body of a 7-year-old female monkey on the cage floor. Overcome with emotion, one technician fled the room. The disturbing event earned Harvard Medical School a slap on the wrist — a warning letter from federal regulators. Official reports of the animal’s death have stated the monkey died prior to going through the wash, but the investigation also found that specialists involved in the necropsy “admit . . . it is nearly impossible to conclude definitively” whether the monkey was dead before the 170 degree wash. The Globe recently also found that Harvard has no evidence that the dozen dehydrated monkey deaths beginning in 1999 were reported to its internal committee that oversees animal care. Other documents sent by Harvard to federal regulators, obtained through the Freedom of Information Act, suggest that the problems Harvard began identifying in 2011 were wide-ranging. There was a fundamental breakdown of basic procedures, including “unacceptable and inadequate record-keeping,” an instance in which animals were not euthanized on time, and questions about how federal grants were billed for blood draws. Tuberculosis tests were not administered properly and over a five-year period, six federal certificates required when monkeys are shipped to other facilities were signed by someone without the authority to do so. Harvard’s own letter to regulators mentions the “long-term nature” of the problems. Harvard has repeatedly said that a committee of external experts was convened to evaluate the center and maintains that problems were self-identified and fixed. The university has denied requests to see a full copy of the report by the consultants and instead provided a brief summary. A reporter’s request to visit the center as it was closing was also denied. What may be most telling is that after a change in leadership in 2011, a slew of animal care problems was disclosed, when Harvard self-reported three primate deaths in the span of five months. In letters to regulators, Harvard officials praised Dr. Frederick Wang, the interim leader during this period, for the “transformative culture of transparency” he had brought to the center. In late June 2012, a detailed, 21-page letter to regulators outlined many changes and ended on a strong note. “Our goal is to ensure that the important science of the [New England Primate Research Center] will continue to further medical breakthroughs, guided by our unwavering commitment to animal welfare,” the unidentified medical school official wrote in the letter. Ten months later, Flier stunned the research community with the announcement the center would close due to financial reasons. The closure cost includes the expense of shipping the animals to new homes, mostly at other research centers. Welkin Johnson, a former Harvard faculty member who moved to Boston College from the primate center, said that one of his biggest concerns is for the animals. Extensive precautions and health checks are taken to ensure their welfare before and during transport,but shipping hundreds of monkeys to new homes could cause stress, he said. Harvard is currently under an open investigation by federal regulators after six monkeys that arrived healthy at the Oregon Zoo last May died two days later. Pamela Caudill, chief research operations officer for the medical school, said Harvard is still in discussions with the National Institutes of Health about whether it will have to return any money from the federal construction grants given to the center. Harvard is also still reviewing its options on what to do with the land. The campus is home to a storage facility for a depository that houses books and other media. Closing costs are “money that would have been better used to support research that ultimately could have continued to combat diseases like AIDS and Parkinson’s, rather than shutting down a productive research enterprise, mothballing a valuable research campus, and walking away from” millions in federal funding, said R. Paul Johnson, a former director of the primate center who now leads the Yerkes National Primate Research Center at Emory University. The fact that Harvard, with its considerable resources and its commitment to cutting-edge research, is shutting its center might be seen as a signal that such studies are no longer important or possible, but scientists — including Flier — said the opposite was true. “Non-human primate research is alive and well and is definitely financially viable,” said Johnson, of the Yerkes center. At that center, Johnson said grant awards in the last fiscal year 2014 were up 13 percent over the previous year, to a record $73 million. Flier said the closure does not create a scientific gap at Harvard and will not erode its leadership in any area. Other scientists disagreed. “I think that Harvard will grow to regret their loss of preeminence in the primate infectious disease research field, once the dust settles,” wrote Nancy Haigwood, director of the Oregon National Primate Research Center.